Last weekend, thinking of my week ahead, I decided I’d like to cook something slowly and included many ingredients from market stallholders so I didn’t have to ask people to go shopping for me as it’s still not easy for me to go to the shops. 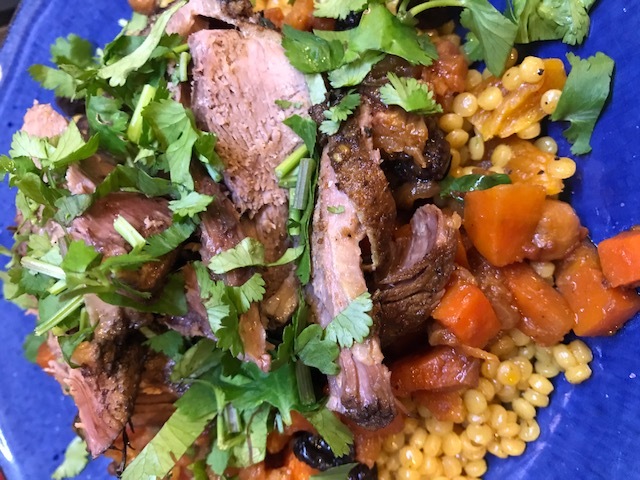 So I went with a small leg of lamb from Karapiro Meats, lots of vegetables from Arek, Moroccan spices and couscous from Soufiane of Besaha, and dried raisins from Tahsin on the Turkish stand. In a small bowl mix 1/2 the crushed garlic with the ras-el-hanout and 3 tbspns of olive oil. Using a small sharp knife make random cuts into all sides of the meat and push some of the mixture into each cut. Use it all up by rubbing any leftover mixture all over the outside of the meat making sure all parts are coated. Also season it well with salt and pepper. Place a large lidded casserole dish (like a Le Crueset) on the stove top and heat a little oil. Add all the chopped up fresh vegetables – carrot, onion, leek, celery and parsnip. Put the lid on, reduce the heat and soften them all. It’ll take a few minutes. Then take off the lid, stir in the rest of the crushed garlic. Cook for a minute, then add the chopped tomatoes, chickpeas and raisins. Mix well. Also add the salt and pepper. 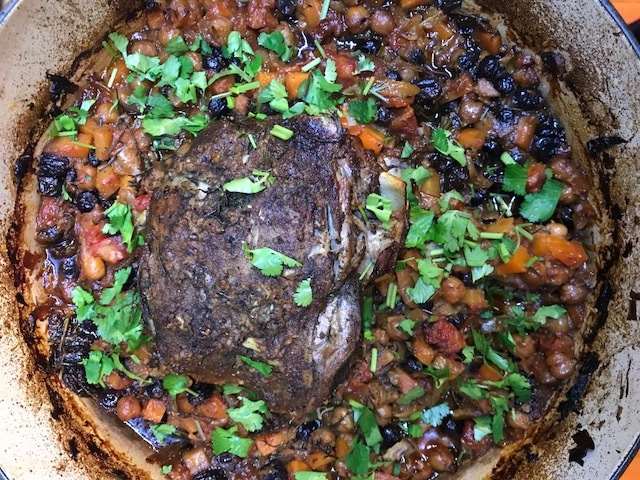 Next nestle the lamb into the dish, surrounding it with the vegetables. Add at least a cup of stock and then decide if it needs more. Add whichever fresh herbs you choose. Put the lid on and place it in the preheated oven and cook for 3-4 hours. After 2 hours check if it needs a bit more liquid, as you don’t want it drying out and its good to have a little juice when serving it. When cooked let it sit out of the oven for a few minutes while you prepare the couscous. Soufiane’s couscous packs are really delicious and make a lovely bed for the vegetables and lamb.